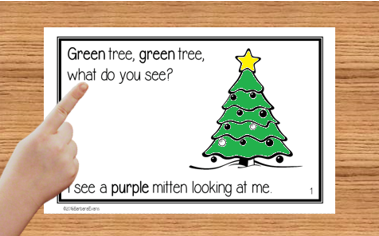 Green Tree, Green Tree, What Do You See? is perfect for the holiday season. The pictures not only support the text, but are inviting to color. 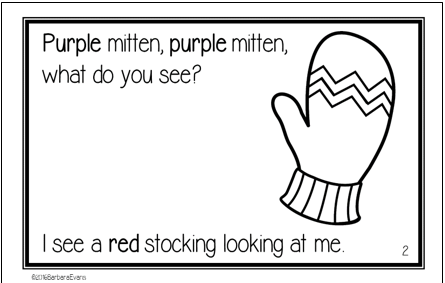 Ask your students to color the pictures, noting the color words in bold print on each page. This will provide additional support for the emerging reader. When working with beginning readers, it is advisable to choose 1 strategy and focus on it until your students show mastery. While I will be covering several topics, you should choose the one that best fits the needs of your students at the time. One of the most valuable lessons I learned in Reading Recovery™ was to avoid the shotgun approach. This Christmas reader emphasizes color words and 14 high frequency words. Some of the HFW may be unknown or partially known. Select 1 word to accentuate as you conduct the book walk. Ask your student to point to that word on each page as you explain the story to him. In this example, the chosen HFW is what. If the word is troublesome on the first read, provide the initial sound whenever the word is encountered. Resist the temptation to teach ALL or several HFW at the same time. 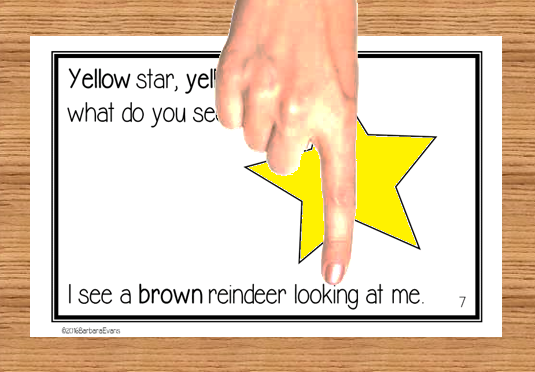 Words such as reindeer and stocking are not HFW, nor should you expect your young learners to know such words in print. The illustrations provide support for these unfamiliar nouns. If a student balks when he comes to these words, remind him to check the picture for a clue. Or, upon turning to a page with a problematic noun, simply point to the picture cue. The last sentence on each page presents a noun that does not have picture support. Either supply the initial sound or simply tell your student what the word is if he stumbles or hesitates. 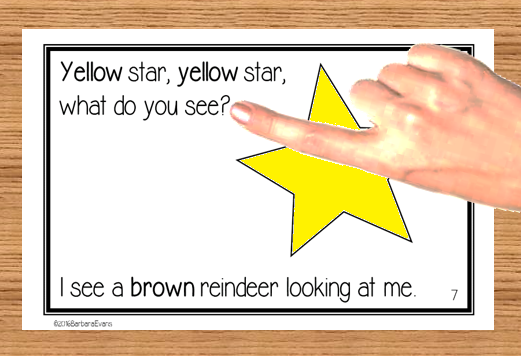 The print is large enough to allow easy pointing to the words as the children read aloud. If your students no longer need to point, require them to point on a few chosen pages. This practice leads the children to self-checking. After reading a selected page, whether correctly or incorrectly, ask the child to read it again while pointing to each word as she reads. Upon finishing that reading, ask her if she had enough words, i.e. was there 1 word for every time she pointed? If the pointing did not match, help her reread with correct pointing. It is important to ask her to check her 1 – 1 correspondence when she is correct at least as often as when her pointing did not match. Otherwise, YOU are the one who has learned to self-check. While the text is highly predictable, there are enough exceptions to require your students to truly attend to it. It is not unusual, however, for polysyllabic words to be problematic. 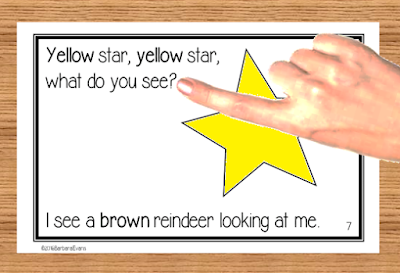 For example, snowman or reindeer may entice your student to double point or get lost in the pointing if she moved on to the next word, but realizes it does not match what she is saying. This is the perfect opportunity to explain that some words have 2 or more beats but still get just one finger point. Again, ask your child to check the accuracy of her pointing both when she is correct and incorrect. Several of the HFW have inflections in this text. If your student is ready for this skill, draw his attention to the word by repeating what the student said. You may wish to leave your finger on the inflected word as you ask him if what he read sound right. 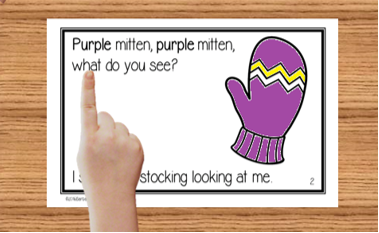 You are leading the child to reflect upon whether his reading sounds like standard English. If the inflection was incorrectly read or skipped, use finger masking to help him focus on and recognize it. It is important to ask the child to assess the accuracy of his reading both when he is correct and incorrect. The lilt of the story encourages fluent reading. However, this book provides ample opportunities for learning to “read the punctuation.” The frequency of commas, question marks, and periods make them obvious choices for “reading the punctuation.” Resist the temptation to “read” all of the punctuation. Choose 1 type to focus on with this book. Introduce the other punctuation with subsequent texts. If, for instance, you decide to work on question marks, model reading the sentence and punctuation correctly. Emphasize the change in pitch that the question mark requires. Then call for the student to use the same pitch whenever she encounters a question mark. If she reads past the punctuation, point to the question mark, leaving your finger there until she rereads and “reads” the punctuation. Learning to “read the punctuation” is crucial to comprehension and fluency. Since this book is intended for the children to keep, be sure to send it home prior to the winter break. Encourage them to read it to everyone at their home. 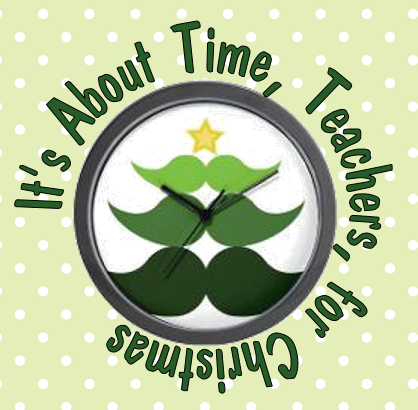 TPT's annual Cyber Sale is 11/28-11/29. Everything in my store is on sale for 20% off. If you enter the code: CYBER2016, you will get an additional 10% off, for a total of 28%. *My store is on sale from 11/27 - 11/30. The extra 10% is only available 11/28 & 11/29.